Members of ARCHCLUB recently returned from a club trip to Philadelphia, PA (May 1st-4th). Some of the highlights (other than raining 90% of the time we were there) included seeing old historical Philadelphia such as Christ Church (Ben Franklin was counted among its members) and other areas of Society Hill, Frank Lloyd Wright's only synagogue: Beth Sholom, newer high-rise Philadelphia including the new Comcast building, City Hall with its William Penn statue at its highest point, and parts of the UPENN campus including Louis Kahn's Richards Medical Research Laboratories. More images are located on the server at school as well as on arktek's flickr page. Have a good summer semester! 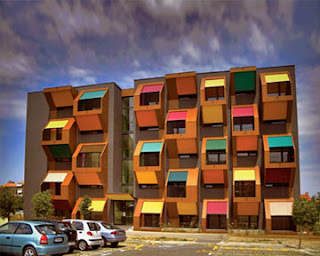 A comprehensive listing of Building Type Studies found on ArchRecord. I have selected the many multi-family residences here. 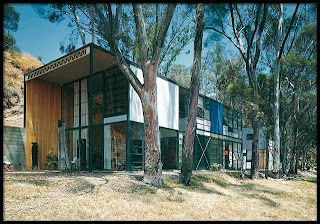 Also, related to the previous post, there are older, more historical examples of multi-family dwellings done as part of the Case Study House program. Here are the online PDF reprints of the original articles from Arts & Architecture magazine from May 1964 (Killingsworth, Brady & Smith)and September 1964 (Alfred Beadle). 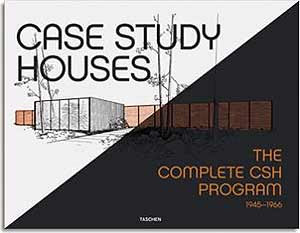 The Case Study Houses were experiments in American residential architecture sponsored by John Entenza's (later David Travers') Arts & Architecture magazine, which commissioned major architects of the day, including Richard Neutra, Raphael Soriano, Craig Ellwood, Charles and Ray Eames, Pierre Koenig and Eero Saarinen, to design and build inexpensive and efficient model homes for the United States residential housing boom caused by the end of World War II and the return of millions of soldiers. 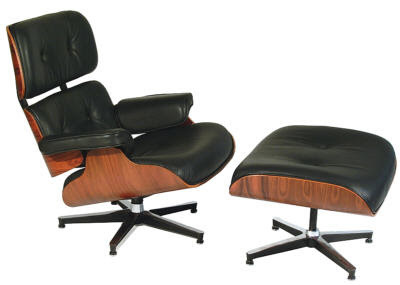 The Eames' CSH #8 was assembled by hand labor in about three days. The program ran from 1945 until 1966. The first six houses were built by 1948 and attracted more than 350,000 visitors. While not all 36 designs were built, most of those that were constructed were built in Los Angeles; a few are in the San Francisco Bay Area, and one was built in Phoenix, Arizona. 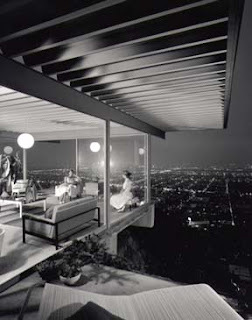 A number of them appear in iconic black and white photographs by architectural photographer Julius Shulman. 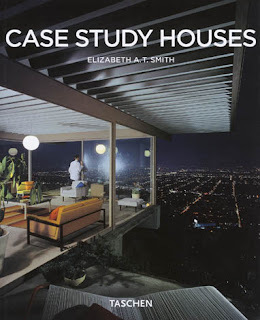 PDFs of the original publications of the Case Study Houses on Arts & Architecture Magazine. Or this smaller version, here. I've been meaning to get this posted for a while. 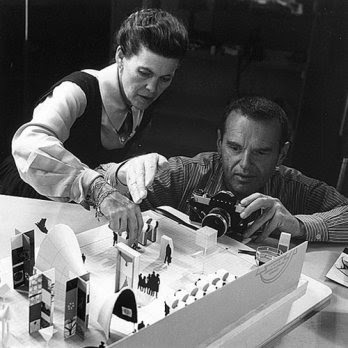 The work of the husband and wife team of Charles and Ray Eames was featured recently at Krankies Coffee in Winston-Salem. Their films, Powers of Ten, 901, and a draft version of Powers of Ten were screened alongside pieces of their furniture loaned for the occassion by a furniture retailer in Greensboro. Several speakers presented their thoughts on the iconic work of the couple, including Peter Marsh of Workplace Strategies. Some of you who were in ARC 111 in the Fall of 2007 will remember him--he was a guest critic during some presentations in that class. Here are some links to some of the most pertinent sites about the couple and their work. For those of you in the second year of the program, you already know this, and for those of year in the first year: you will hear the instructors talk about Frank Lloyd Wright A LOT. He is the Architect about whose work more books have been published than any other in history. 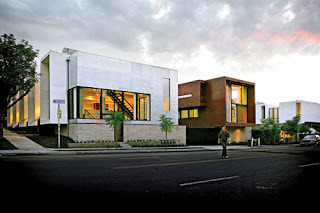 He was very prolific, worked for a very long time and was as dedicated and devoted to Architecture as anyone could be. If you'd like to find out more, here is the official FLW site. For those of you more inclined to start with Wikipedia, here you go. The Architecture Club visited three of his residential projects on our trip to Washington DC and Pennsylvania last May. There are photos of the trip in the Architecture Club folder on the server at school. But if you are at home, here are my pics of Fallingwater, the Pope-Leighey house, and Kentuck Knob (we weren't allowed to take pics inside this one). Here is the official Fallingwater website. Here is a video that is from the Unity Temple's website. 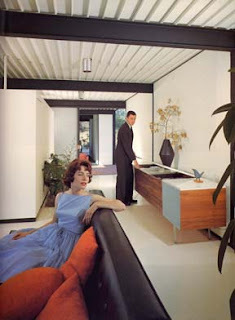 And here is a basic Google image search on FLW. Architecture on Air is a new kind of academic lecture series featuring podcast interviews available on the college's website, www.coa.uncc.edu, and iTunes. This unusual format is by design as the series is meant to focus on helping students build a more nuanced and attentive language with which to describe the built environment and their own work (as opposed to fixating on images). Welcome to the AIAS Podcasts--your free downloadable broadcast of opinions, news, funny stories and ideas from the American Institute of Architecture Students. This podcast series is geared for design students, professionals and those interested in discussions, opinions and ideas of architects and other design professionals who are at the vanguard of the profession. Architecture Knowledge Review is a podcast series for design professionals, featuring interviews, discussions, and best practices by architects and other design professionals who are at the forefront of the profession. Visit this page often for more information on specific topics and presentations. 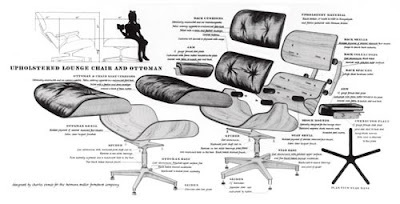 From your iPod to the Freedom Chair to the Walt Disney Concert Hall, design and architecture shape our world. On DnA: Design and Architecture, host Frances Anderton talks to design world leaders about the latest in products, fashion, graphics, architecture and more, in Los Angeles and beyond. 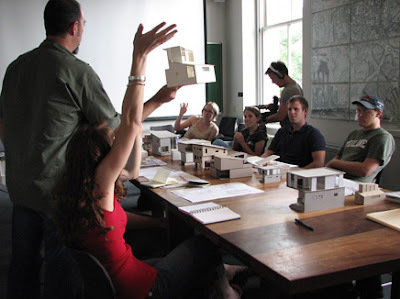 This Wednesday, August 20, 2008, the Sundance Channel will premiere Architecture School. 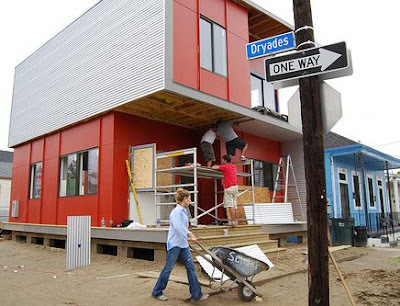 The docudrama follows twelve students enrolled in the Design/Build Program at Tulane University's School of Architecture as they build a sustainable, design-forward home for a family returning to New Orleans. In a nutshell: "Architecture School" tells the story of twelve idealistic architecture students who are bringing a social mission into the classroom by working with communities and populations that do not traditionally have access to architects. Although it's considered reality TV, the series was filmed more like an old school documentary told from a classic fly on the wall point-of-view. Selditch, who spent most of the time on-location, mic'd up each student while he asked questions, but took himself, as narrator, out of the final editing leaving the experiences of the team building the house, neighbor's opinions, the staff at housing services, and the life of the city to tell the story. 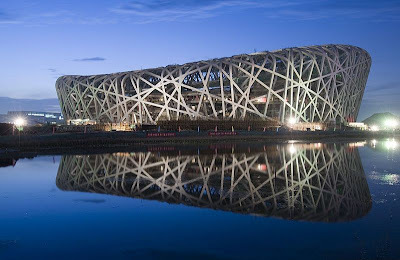 Well, I was going to put together a little tribute to Chinese architecture a while ago...with the Olympics coming up soon, there has been a tremendous amount of attention in the Architecture community placed on China in general and Beijing in particular. There has been a building boom going on throughout much of China even without the extra high-profile projects undertaken primarily for the games this summer. I also wanted to contrast the flashy new construction with the rich history found in Chinese Architecture as well. I had put this little investigation on hold but was reminded of it today when Shayna was looking into traditional Chinese style and the pagodas' uniquely shaped roofs. Also on Arch Record, the PROJECT PORTFOLIO looks at 15 works in China right now. 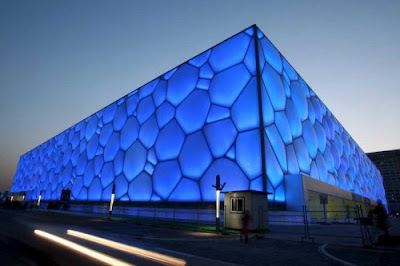 Lastly on Arch Record, a GREAT article on Architecural Technology behind the new aquatic cube for the swimming events. 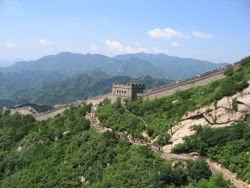 Even one of the Seven Wonders of the World is a work of Chinese Architecture and Engineering--The Great Wall of China. 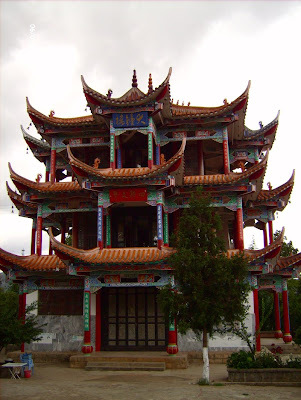 Extensive Wikipedia entry on Chinese Architecture. 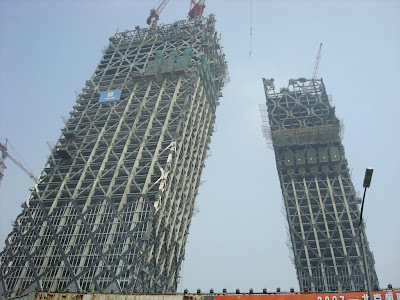 Google image search: Chinese Architecture. A set of photos on flickr from the ARC 230 field trip to the W-S Family Services Bldg--expected to be Winston-Salem's first LEED cert. building (Silver). Leading the nation in environmental initiative once again, the California Building Standards Commission has unanimously approved the country’s first green building code for all new structures—from homes to businesses, schools to hospitals—built in California. As part of its goal to curb emissions by 2020, the new standard is voluntary for now, but will become mandatory in 2010. This green code looks to decrease each new project’s carbon footprint, reducing energy use by 15 percent and landscape water use by 50 percent. It will also mandate that more recycled materials be used during construction. 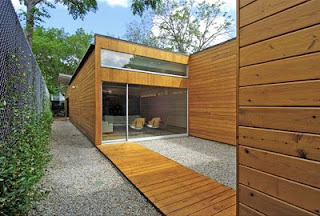 Read the whole story here on Architectural Record's website. We know that California is usually the most progressive state and often initiates things like this first...makes me wonder how long it will be before other states, especially here in the south, will follow their lead. Just yesterday (July 22, 2008) we visited what is expected to be the first LEED certified building in Forsyth County, the Family Services building on S. Broad St., on a field trip for the ARC 230 Environmental Systems class. We really do have an opportunity here in the South, with this curriculum and its dedication to keeping sustainability front-and-center, to be part of the South's catching up with the wave of sustainable building design. 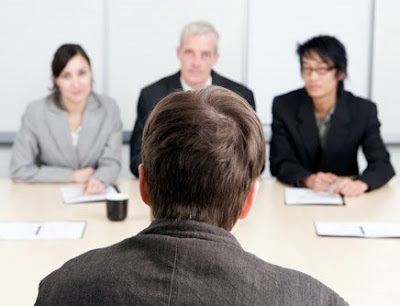 Here is a feature on Archinect about the job search/resume/portfolio issue and what firms (at least those participating in this survey) expect from applicants. Here is a link to a set of photos from the Proximity Hotel, taken while on a field trip for ARC 230 Environmental Systems class. Proximity expects to get the results soon and is anticipating a LEED Platinum rating from the USGBC, which would make it the first Platinum hotel in the country. There are also pictures loaded onto the server at school in the ARC 230 folder. Google Search results, which include numerous press items covering the Proximity. Archiculture is a documentary that captures five diverse students in a single studio at one university throughout the entirety of their thesis project. The film will convey a mere sliver of time, wholly representative of the experience to create a student’s paramount work. The footage will illustrate the range of emotions and process of this extremely intense period at the conclusion of an academic career. It is our goal for the documentary to possess educational, entertaining, realistic and inspiring qualities in response to the dynamic world these students cross. Here is the MIT Press link. Here it is on Amazon. Read some of the reviews too. 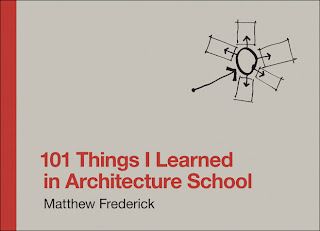 Matthew Frederick is a Registered Architect, urban designer, and the author of 101 Things I Learned in Architecture School (MIT Press, 2007). He is the president of the Frederick Design Studio in Cambridge, Massachusetts and has taught at Wentworth Institute of Technology, Boston Architectural College, and other schools of architecture. Additionally, he has served as a design critic at Drexel University, Pennsylvania College of Art and Design, Philadelphia College of Textiles and Science, and Temple University. A link is being added to the right hand column in two places: as an image of the logo and as a link in the list. There is a lot of good information on this site, as well as links to other great sources of information. 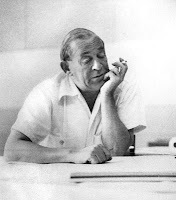 The official Alvar Aalto Foundation page--located in Finland. Be sure to click the little blue images in the upper right corner. Aalto's work at Great Buildings Online. 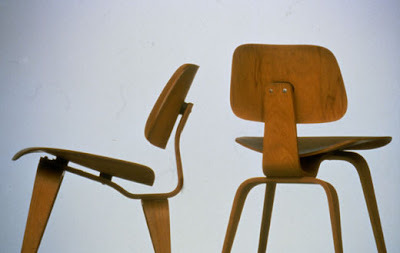 New York's Museum of Modern Art (MoMA) Aalto exhibit online. Another great overview on Design Museum. Includes pictures of some of the furniture he designed. Speaking of images: Google images search for "alvar aalto"
There are two main groups/pools on flickr. There is an Alvar Aalto group and an Alvar Aalto's Architecture group. Each of these contain pictures of Aalto's buildings and furniture uploaded by members of these online groups around the world. Here is the video shown in ARC 230 if you want to see it again. There is a link to the right for Architecture for Humanity. Here is a link to the video on the TED website. 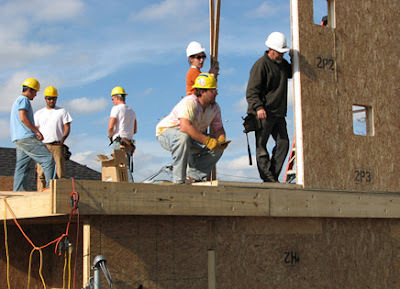 This is a blog set up for use by the Architecture Club at Forsyth Technical Community College.